`Below is information and pricing on the various wheels produced by EPI Plastics. Castor manufactured by EPI. Steel axles and pivot. Plastic cover guard. Twin wheels. Wheel diameter 4cm or if include the cover 5cm. Each wheel has a width of 1cm, width of unit (both wheels) 3.5cm, height to top of plastic cover 4.5cm, bottom of wheel to top of pivot 7.5cm. 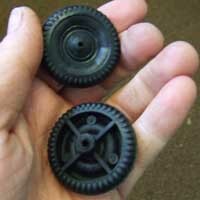 Small polypro wheels - made from old Plunket Baby Seats and similar waste plastic. This is a popular wheel used by Scouts to make small wooden cars. This is from our Dune Buggy, no longer a stock item. Sometimes we are out of this spare part. Please enquire. Injection moulded. Very strong. Diameter 10.5cm, Width 2cm, Axle hole 6mm.